Devil's shoestrings are a wonderful botanical curio to have on hand and these are hand-ripped by me. These cane-like suckers and ground roots come from several species of vibernum which grow in woodlands of the mid-west here in north america. They are related to the honeysuckle vine and possess the same aspect of binding. Devil's shoestring is used for protection, to "trip up the devil" so he can't get in your home or life. They are also carried for gambling luck and for gaining employment. Some folks drive them into the ground around the front door or place a bundle of them above the door or mantelpiece. 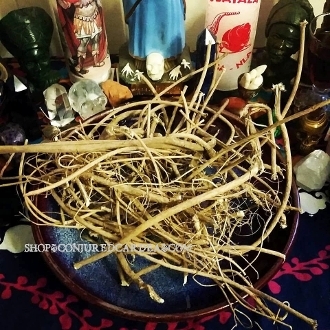 In the beginning of hoodoo, people would wear an anklet made with nine pieces of devil's shoestring and a silver dime to prevent being "poisoned through the feet" by stepping in goofers dust or other foot-traffic tricks. Using 9 devil's shoestrings roots, wrap them nine times around with white thread and each time you wrap the thread around, tie a knot, so you end with a total of nine knots. Place this in a bottle and fill it with whiskey or rum. Leave the bottle to soak for nine days. Upon gambling, applying for a job, or doing anything that requires luck, dip your fingers in this mixture and then run them through your hair nine times. You can also use this liquid to dress mojos, charms, or lodestones. Now, those of us with short hair, may have to utilize this best as a hand rub. Devil's shoestring is an expensive root and I've done my best, as always, to offer you a good price on an organic hand-harvested root. Now, you may be able to find it cheaper, but it is even true devil's shoestring, and where and how was it harvested? What kind of information do they offer about the herb? Get the most out of your practice by knowing your seller. You will receive a 2x3 inch zip bag of peices. This is a natural item and pieces will vary.